Our successes in our effort to help rescued animals are thanks entirely to people like you. When you click and view sponsor ads, purchase from our store, or make a direct donation to one of the many wonderful programs we highlight and support, you produce results like these. Thank you for your support to help animals in need and the rescues that care for them! Pet food is an expensive and never-ending need for shelters. What if we could remove some of that expense? Every year, brand name pet food manufactuers donate millions of pounds of pet food that shelters can make excellent use of if only they can get to it. That's where Rescue Bank comes in, with a national distribution network serving thousands of shelters and delivering millions of meals. Rescue Bank has even stepped in during disaster response, including meeting 100% of the requested need for Puerto Rico after Hurricane Maria. How has food helped shelters do even more? When food is taken care of, shelters can focus resources on other needs - like rescuing a kitten from a foot-long earthworm. When Kitty Cat Connection found Monsoon, he was crawling through a downpour to escape a semi-feral colony. Monsoon was barely six inches long, and weighed just eight ounces. Worse, it was cold outside and the rain was torrential. His rescuers report, "The heavy rains had driven the earthworms out of the ground, and a forefinger-thick nightcrawler that was fully a foot long... somehow caught up with poor Monsoon and wrapped around him like a boa constrictor. And though it probably couldn't hurt him, it was scaring him. Not to mention us." Monsoon was still nursing, and they could not find his mother. With the money saved thanks to Rescue Bank, they were able to give him the intensive care and medicine that he needed, and they microchipped him as well. It's a good thing they did. He was adopted when he was healthy - no wonder, since he was an awfully cute kitten - but his first family later dumped him in the city streets. Monsoon's rescue luck held up even against that cruelty. 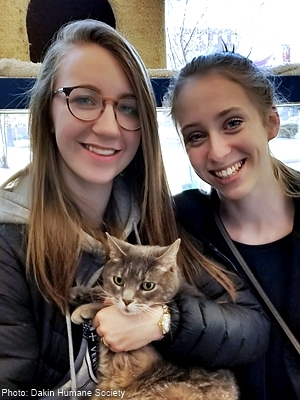 A good Samaritan found him, and a veterinarian scanned the chip and returned him to Kitty Cat Connection. So many people came together, each contributing a little bit in different ways, to save this kitty. It paid off in the end, because not long ago, Monsoon finally found his real furrever home. Do more to help our signature Rescue Bank program, and other programs supported by GreaterGood and The Animal Rescue Site! Rescued animals gobble up money faster than most shelters can raise it. It's not their fault; they desperately and immediately need food and care, medicine, baths - you name it. But it means that shelters don't get facelifts very often, even when the linoleum is wearing through, the standard for cat housing has changed, and the dogs can only dream of running leashless through the yard. Luckily Rescue Rebuild has their backs, with renovations that focus on improving quality of life for pets and staff - and ultimately getting more animals adopted. How can a renovation be so important? The City of Lindale in Texas didn't even have a place to adopt out animals - until Rescue Rebuild came through. Lindale does not have a traditional shelter, and their holding facility is not open to the public. For dogs and cats looking for the perfect forever home, chances of adoption were pretty slim. MuttNation worked with the city of Lindale for years to run life-saving transports to other shelters, but it wasn't enough. Luckily, Lindale is also hometown to country music singer Miranda Lambert. Lambert is one of country's top artists, with hits that include Kerosene, Gunpowder and Lead, Mama's Broken Heart, and The House that Built Me. She is also just as passionate about animals as she is about her music. 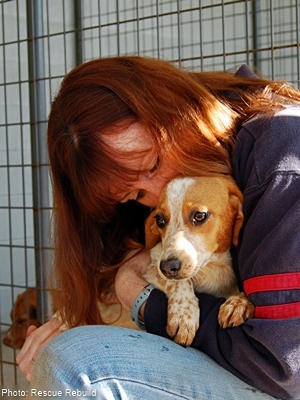 With her mother, she started the MuttNation Foundation to help as many rescued pets as possible find loving forever homes, and they had a dream for Lindale. They wanted to create an adoption center next to a dog park that would allow rescues from all over the area to hold adoption events. And that's where Rescue Rebuild came in. It took weeks of hard work and dedication from everyone, including Rescue Rebuild experts, electricians and plumbers suggested by local rescues, and volunteers who had no construction experience but were ready to lend a hand. Lindale donated the land and a dilapidated house; Rescue Rebuild had to move the house over, tear out the existing interior, and build a functional adoption center - not to mention the dog park. But the will was there, the volunteers were passionate, and everyone persevered until at last, it was done. Today 20 rescues and adoption partners, including the Lindale holding facility, use this glorious new center to save lives. Lambert's dream - and the dream of so many others - has come true, thanks to Rescue Rebuild. Cats have a rough time in shelters. They aren't well-suited to busy, noisy environments, and frightened cats hide under bedding and cower in corners - the worst thing they can possibly do when a potential adopter strolls through. In 2018, GreaterGood.org, The Animal Rescue Site, and The Jackson Galaxy Project came together over a program called Cat Pawsitive. The program, which will be in 50 shelters across the nation this year, uses positive reinforcement training to help shy cats connect with humans they don't know. How can teaching a cat to high-five possibly increase low adoption rates? Cats are trained with the goal of decreasing stress and building social skills. For cats like Chloe, it works! Chloe was surrendered when her human had to go to a nursing home. She was sad and shut down, and spent a lot of time hiding. "We moved her to an office so she could have a human friend," says Alanna at the Dakin Humane Society. "Soon after her arrival, our vet team performed an extensive dental. Her mouth was on its way to feeling better, but Chloe was still hiding behind her office friend's computer." 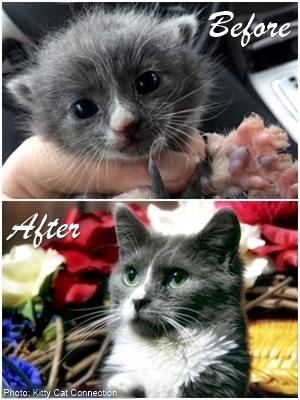 This sweet kitty was enrolled in the Cat Pawsitive program, and it made a difference. She learned to make eye contact, and to touch her paw to a human hand for a treat. Slowly she became more adventurous and trusting, coming out from behind the computer and relaxing around people. One day she came out from under the desk, meowed, and flopped over in front of some visitors, hoping for belly rubs. How could they resist? They couldn't, of course. Now Chloe is living happily ever after with the purrfect new family. Do more to help our signature Cat Pawsitive program, and other programs supported by GreaterGood and The Animal Rescue Site!